Heart Sachet designed by Kristin Nicholas from Crochet Red: Crocheting for Women’s Heart Health by Laura Zander, published by Sixth&Spring Books, sixthandspringbooks.com. Photography by Marcus Tullis and pattern instructions copyright © 2013 by Sixth&Spring Books/Soho Publishing, LLC. All rights reserved. Used by permission. February is American Heart Month and time to join together to support heart health and research. Heart Disease remains the #1 killer of women in the U.S. and is more deadly than all forms of cancer. Stitch Red is an industry-wide campaign to raise awareness about heart disease and help women recognize and reduce their risk factors. All vendors involved with Stitch Red donate a percentage of their gross profits from the sale of Stitch Red products to the Foundation for the National Institutes of Health (FNIH) in support of The Heart Truth®, a national awareness campaign for women about heart disease. 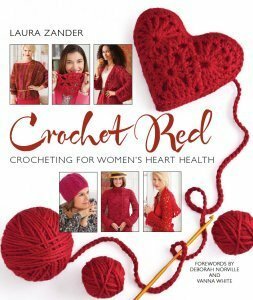 Crochet Red features more than 30 of the most popular crochet designers and celebrities that have come together to help raise awareness of heart disease with dozens of gorgeous projects and a wealth of information, tips, and personal stories about the importance of staying heart healthy. 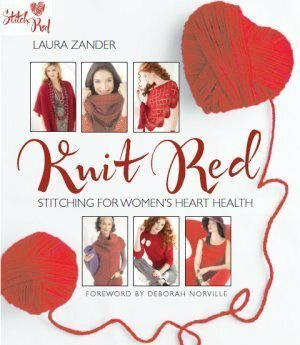 Knit Red contains 30 fabulously red garments and accessories designed by celebrity designers who openly share their personal experiences with heart disease and tips on how they stay heart healthy! The book also includes heart disease prevention tips from The Heart Truth®, including healthy recipes, exercise tips and more. 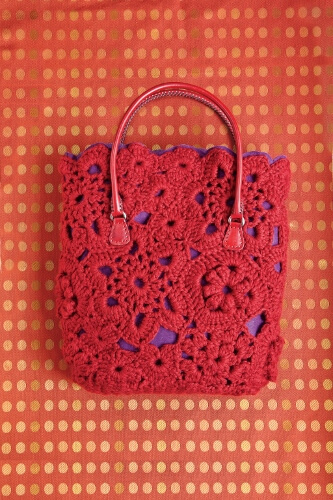 Mixed Motif Tote designed by Erika Knight from Crochet Red: Crocheting for Women’s Heart Health by Laura Zander, published by Sixth&Spring Books, sixthandspringbooks.com. Photography by Marcus Tullis and pattern instructions copyright © 2013 by Sixth&Spring Books/Soho Publishing, LLC. All rights reserved. Used by permission. Tunisian Shrug designed by Kristin Omdahl from Crochet Red: Crocheting for Women’s Heart Health by Laura Zander, published by Sixth&Spring Books, sixthandspringbooks.com. Photography by Rose Callahan and pattern instructions copyright © 2013 by Sixth&Spring Books/Soho Publishing, LLC. All rights reserved. Used by permission. Beaded Lace Shawl designed by Andrea Jurgrau from Knit Red: Stitching for Women’s Heart Health by Laura Zander, published by Sixth&Spring Books, sixthandspringbooks.com. Text copyright © 2012 by Laura Zander; photography by Rose Callahan copyright © 2012 by Sixth&Spring Books/SoHo Publishing, LLC. All rights reserved. Used by permission. Reversible Wristers designed by Kit Hutchin from Knit Red: Stitching for Women’s Heart Health by Laura Zander, published by Sixth&Spring Books, sixthandspringbooks.com. Text copyright © 2012 by Laura Zander; photography by Rose Callahan copyright © 2012 by Sixth&Spring Books/SoHo Publishing, LLC. All rights reserved. Used by permission. Aren’t those projects awesome!! There is one last project I want to show you that I really love … this beautiful heart sachet designed by Kristin Nicholas. And guess what … Stitch Red is so generously giving you a copy of it for free!! 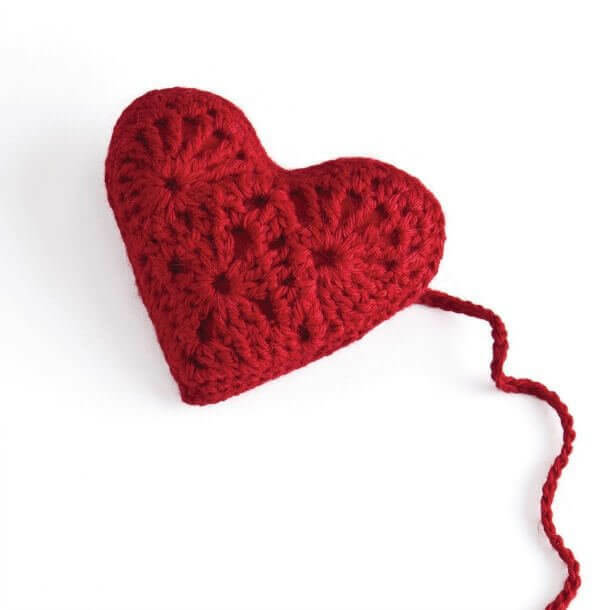 Click here to download your free copy of the pattern … Stitch Red Heart Sachet Pattern. And be sure to pop on over to Stitch Red’s Facebook page and give them a big thank you for the free pattern and to show your support for their hard work in raising heart health awareness. Thank you for the free download of your pretty heart sachet, but nothing I do can get it to print out. After trying the download three times and trying a screen capture of the download, I’ve turned off and on my printer, off and on my computer and printer, and still cannot get anything but a blank page. Is anyone else having such trouble? Hmmm … I’m not sure what could be wrong. It is opening and printing fine for me.